To test switches without having them available on the layout. Or to find out at which address a switch is activated. This is Command Station dependent. ; Check the manual for details. Some decoders, like BiDiB LightControl and RocNetNode, provide different port types on the same local address. If the switch commands should go to another command station as the default this field can be used to set the destination. The decoder number. 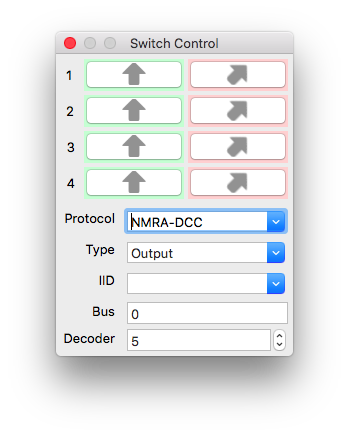 NMRA decoders have 4 port pairs, and the addressing is conform NMRA. The tooltips of the port buttons will display the FADA and PADA address.